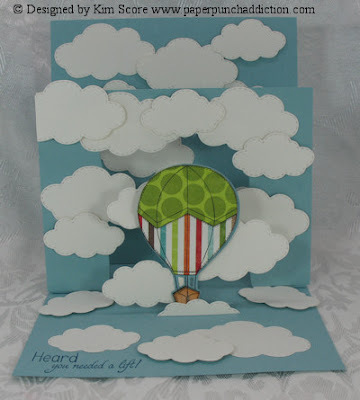 Today I have the feature over at My Creative Time and I'm going to show you how to create a Showcase Card. I used the awesome Fly Me Away collection. There is an image set, sentiment set and die set. You may recall the circus tent with baby elephant card I made a couple weeks ago HERE. At that time I said I would try and come up with the tutorial once I perfected the technique. Here is my first version of the technique. Down the road, I'll share an A2 size card which may be a little tricky given the smaller size. This finished card when folded flat is 6" x 6" in size. You will notice that the front frame is smaller than the back on the easel. I did this so that when it's folded flat, it's exactly 6x6. If you want to make the front frame the same size as the back, you can. Just note that when it folds flat, it will be larger than 6x6. Of course, if you don't plan on putting it in an envelope, it doesn't matter! Please download the step by step tutorial in pdf format. The link is below the picture. Click on this link to download the tutorial in PDF format. This is brilliant. Thanks for sharing the tutorial. What a wonderful tutorial! Thank you so much for sharing this great project technique! Love it! Wishing you a happy day! Looks like fun, Kim! I pinned it! WOW!!! This is fabulous - may now have to buy the Air Balloon set...! TFS, printing your tutorial now...Thank you! Thanks for the tutorial Kim. I can't wait to try this one. Totally awesome card! I love it! Thank you for the tutorial Kim. Fabulous card. Could not download...looks like other could from the above comments. Awesome idea from the looks of the card. Thank you for your instructions. I love this card. Awesome card. Thank you so much for sharing the tutorial. Sensational card. Thanks so much for the great tutorial. You've inspired me to give it a try. Yet another amazing and creatively unique card idea! Thank you for sharing the tutorial, can't wait to give it a try. If possible, would you mind posting a photo of what the card looks like when folded flat...am having a hard time visualizing it in my brain...! Thank you again for generously sharing this with us.